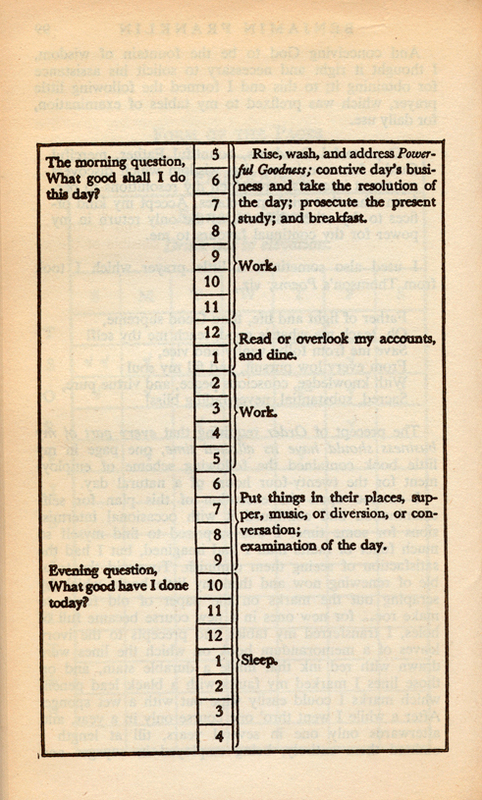 This schedule is a different twist on the usual time management tool. BF not only lists what he plans to do, but schedules in terms of meta-level reflection on the purpose his actions serve. In BF’s ideal world his activities are an answer to a question about “the good.” In other words, he makes explicit the connection between the substance and the purpose of his actions. I came across this schedule as I was in the process of setting up a new version of the document with which I project manage my life, but it occurred to me that this image might also be useful in thinking about the substance versus the purpose of arms control and disarmament treaties and negotiations (AC&D). I argue elsewhere that the explicit substance of AC&D is the control of nuclear weapons and their constituent elements, but the implicit purpose of them is to resolve disputes about dominance and hierarchy between the great powers. Since one of the purposes of this blog is to have a place to collect all the marginalia that might contribute to thinking about nuclear philosophy, I am sticking this image up here to remind myself to think about the substance and purpose of AC&D in terms of an answer (substance) to a question (purpose). For instance, to what question is the Limited Test Ban Treaty an answer?